I coloured these cuties with Copics and mounted them on a background created with a masked hillside and Distress Inks. I added some Nuovo Glitter Drops for some sparkle. Great card Sue love the image you chose and also the background is fabulous too! 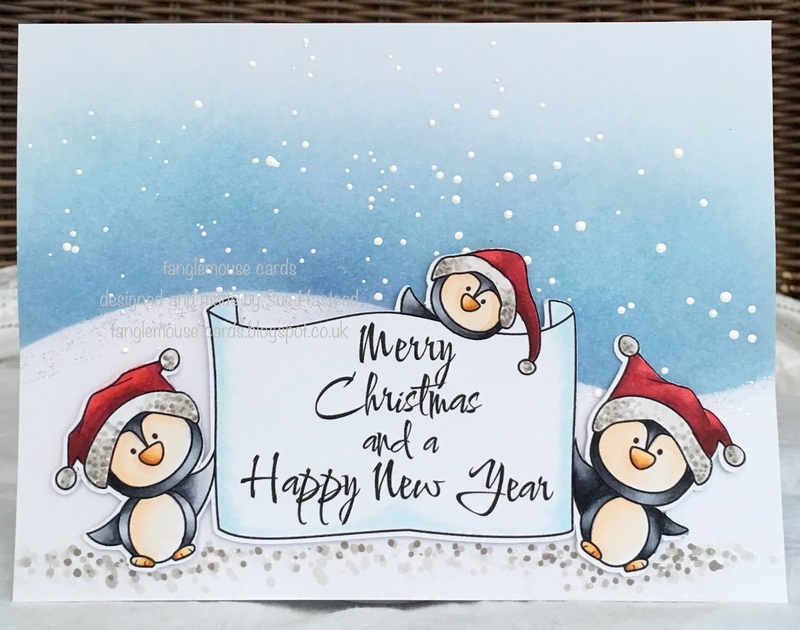 Such a sweet card, these fun penguin trio are gorgeous. Love it. Wow!!! This is fabulous Sue... I have a weakness for little penguins and these are oh so cute! My eye is taken to that sky though.......... the definite WOW factor as it looks so good...... I think I'm going to have to get some chunky frantage!! Aww so super cute!! Great inked background and such s lovely image! Beautiful card Sue, I love the scene you have created and your colouring is fab especially of the penguins...I always shy away from colouring anything black, I'm going to study how you have done yours and have a go now you've inspired me ! gorgeous card Sue. hope you put it also in my facebookgroup Christmas cards only. Adorable! Great card and I love the penguins. I think I'm going to have to head over to the Boutique and get that dig! Love DSB images and this one is so cute. Love what you've done with them. They are a cute little bunch! FABulous scene Sue. LOve your colours too. A gorgeous card Sue! I love the scene you created! Fabulous card - love how you did the background!